CNC machining is used everywhere in our daily life, but most people don’t know much about it. When people ask, how does this part come out? If you are not a person who works with CNC machining, you can only shake our head. What is CNC Machining Technologies? CNC is the abbreviation acronym of Computer Numerical Control. CNC Machining is a process used in the manufacturing sector that involves the use of computers to control machine tools. There are many machine tools that can be controlled in this manner, such as lathes, mills, routers and grinders. When you step into a CNC machining workshop, you will just find a normal PC controls the machines. The key part is the computer’s unique software and control console. Before operating CNC machine, the CAD drawing is created(both 2D and 3D are ok). Then a code is created for machining. The computer program should be customized for an object then. And the machines are programmed with CNC machining language what is called G-code. The machining language controls all features like feed rare, coordination, location ,speed and so on. With CNC machining, the computer can control exact positioning and velocity. After all above are done, an operator will run a test of the program to ensure there are no problems. It is a very important step, since any mistake with speed and tool position could result in a scraped part or a damaged machine. The process is more precise than manual machining. It can be repeated in exactly the same way again and again. It can produce complex shapes that manual machining could not achieve. It is always used in jobs that need a high level of precision or very repetitive tasks. Since the CNC machining technology is developed constantly and quickly these years, our daily life has a big change. And more and more people begin to pay attention to CNC machining and it will be a great potential in the future. 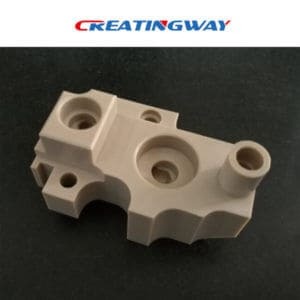 Creatingway provide you more metal and plastic cnc machining manufacturing services, from varous industry such auto parts, oil&gas, IT, Bike parts, a series of components machining, and also offer seconday machining finishing services, we can make your projects perfect and so easy. Can Good Machining Skills Replace The Surface Treatment?